William Brown was born on 10 August 1889 at Drumnagar, Cootehill, County Cavan, the third or fourth child of farmer James Brown and his wife Mary Eleanor (nee Argue). After growing up on the family farm, on 1 February 1910 he joined the Royal Irish Constabulary (No.65176), stationed at Galway then Belfast. On 18 May 1916 Brown enlisted in the North Irish Horse (No.2172 – Corps of Hussars No. 71707). 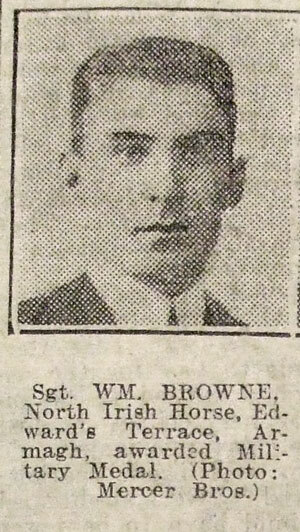 Between 1916 and 1918 he embarked for France, where he was posted to E Squadron of the North Irish Horse. From May 1916, E Squadron was part of the 1st North Irish Horse Regiment, serving as corps cavalry to VII, XIX then V Corps. In February-March 1918 the regiment was converted to a cyclist unit, serving as corps cyclists to V Corps for the remainder of the war. The North Irish Horse cyclists saw much action during the Advance to Victory offensive from August to November 1918. Following the fighting in mid-September, Brown was one of five men of E Squadron awarded a Military Medal. Brown was demobilised and transferred to Class Z, Army Reserve, on 19 February 1919. On the following day he was readmitted to the Royal Irish Constabulary. On 1 August 1920 he was promoted to sergeant. He was stationed at Belfast, Donegal then Fermanagh until 1922, when the force was disbanded. Image from the Belfast Evening Telegraph kindly provided by Nigel Henderson, Researcher at History Hub Ulster (www.greatwarbelfastclippings.com).